This paté brisée recipe is one of the basic French recipes for what most of us call the short crust pastry. Paté brisée is often a good choice of pastries to use when making tarts with fruit which have a very juicy nature such as plums. 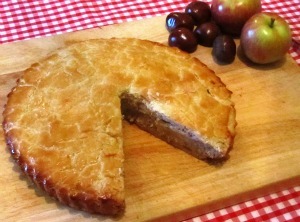 It is also one of the most popular French pastries for making savoury tarts and quiches. This recipe will make enough for a 9-inch Pie or Tart or for Ten 3-inch tartlets. · 4 tablespoons (2 oz) chilled vegetable shortening. · Place the flour, salt, sugar, butter and vegetable shortening into a large bowl. · Rub the flour and fat together very quickly until it resembles fine breadcrumbs. · Add the water and blend quickly until you have the mix into a ball of dough. You may need a few drops of extra water to pick up it all, however, do not over do it or the pastry will be hard. · At this stage the French do what is called a fraisage, or the final blending. · Place the pastry dough on the floured board and using the heel of the hand, press the pastry down and away from you. Gather the pastry back into a ball with a scraper and place into a waxed bag or polythene bag which has been lightly dusted with flour. Place the dough in the refrigerator or about 2 hours. · If you prefer, you can make your paté brisée recipe ahead of time and make it the day before, keeping it in the refrigerator overnight. · When rolling out your pastry do this quickly so that the fat does not soften. It is very difficult to handle when this happens. However, if this does happen you can just press it to fit into the tin and even though it may not look professional, it will still taste wonderful. Just don't worry, you will soon learn the technique! Here are some tips on using your pastry for a pastry shell for your French tarts.